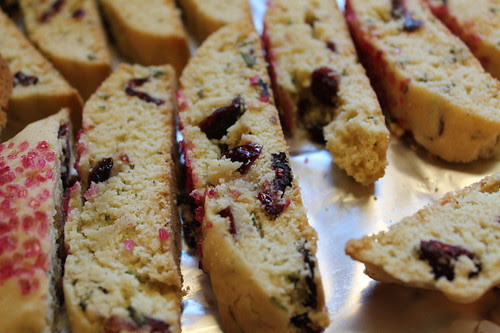 This Christmas biscotti is perfect for Christmas morning! Preheat oven to 325 and line baking sheets with parchment paper. Beat the sugar with the butter until fluffy. Add in egg and vanilla. Slowly add in the flour, cinnamon, baking powder and salt until combined. Mix in cranberries. Divide dough into 2 pieces and shape with floured hands shape into 2 logs about 9 inches long and 1 1/2 inches wide. Place onto cookie sheets. Bake for 30 minutes. Remove from oven and allow to cool for 15 minutes. Slice logs on the diagonal into about 1/2 inch slices. Place back onto backing sheet, sliced side down and bake another 20 minutes. Remove from oven and allow to cool. Melt the chocolate chips in a double boiler. Once melted dip one end of the biscotti in and drip off excess. Place onto cookie sheet and sprinkle with the red and green sugar. Allow the chocolate to set and enjoy!